Excavation at a Derbyshire hillfort has thrown up unique evidence for the massacre of women and children during the destruction of the fort. Clive Waddington discusses the dig, and what this discovery means for the continuing debate about the function of these sites. Iron Age hillforts have recently been seen as symbols of status, wealth, and power; as settlements, built during times of relative peace, to compete with neighbouring groups for prestige — rather than as defensive enclosures, with a more serious military function to their impressive ramparts. There are few examples that have been excavated on any scale in Britain, and thus we are still at an early stage in our understanding of these sites. As more are investigated, evidence is coming to light that shows that Iron Age Britons were no stranger to larger-scale violence than previously thought. Fin Cop, in Derbyshire, is just one of these sites: where a community met a gruesome, and sudden, end. 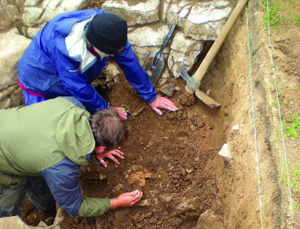 We excavated at Fin Cop over two seasons, in 2009 and 2010. The first work to be undertaken on the site was a detailed survey, which revealed an enclosure defined by a single bank and outer ditch, with a very short section of a second outer bank and ditch at its north-eastern corner. A single entrance can be clearly seen on the east side, and an alignment of facing stones protruding through the turf on either side of the entrance passageway appears to be in situ. It was not immediately clear from surface survey whether the rampart continued along the top of the scarp edge, although a small defensive work on this side was hinted at by the surface scoop sand quarrying that could be observed along part of the western perimeter. Subsequent excavation (Trenches 7 and 8) showed that the scarp edge had been deliberately quarried back, and the stone used to construct a small wall immediately above the break in slope, some of which survived in Trench 7. Dating evidence finally came to light in the excavation trenches that ran over the hillfort ramparts (Trenches 1 and 5). In both cases, they revealed a very substantial stone-built wall, made from native stone, which had since been turfed over. The wall measured 4m in width, and had a carefully constructed outer stone face and a stout, but less neatly finished, rear revetment. The core of the wall was made from laid stone, not just a rubble fill. The stones of the outer face were typically substantial; in Trench 5, these survived three courses high in places. Estimating the original height of the wall is a bit difficult, but, given the size of the external rock-cut ditch and the amount of material this would have produced, a height of between 3m and 4m above the natural ground surface is probably close. The wall foundations sealed a pre-existing ground surface, which contained charcoal flecks — suggesting that it may have been burnt prior to the construction of the wall. Samples taken here of hazel charcoal produced radiocarbon dates spanning 760-390 BC. We excavated the rock-cut ditch outside the wall to a depth of over 2m, and it was the sequence of fills within the ditch that began to reveal something of the hillfort’s secrets. At the base of the ditch next to the inner face, a small deposit of primary ditch silt survived that contained fragmentary remains of animal bones and a small assemblage of plant remains. The animals present included domestic cattle, pig, sheep/goat, and horse, whilst yew, hazel, ash, and probably blackthorn are thought to have grown in the vicinityof the site. Radiocarbon dated samples from this deposit produced a date of 480-380 BC. The construction of the rock-cut ditch and defensive wall must have taken place between the date of the pre-existing hillfort land surface and the accumulation of the primary ditch silt. By applying Bayesian statistical modeling to the dates from each the two deposits, which effectively ‘sandwich’ the construction of the hillfort, a much tighter estimate of 440—390 BC was produced, providing clear evidence for a mid-Iron Age date for the fort’s construction. This was merely the beginning of the secrets, however, and we were about to be very surprised by further discoveries. Overlying the ditch silt was a fill of tumbled stone, many of which had dressed faces on one side. Given the slope of this material, it is clear that these were stones from the defensive wall, which had been thrown into the ditch to level the ramparts. More of this same material was observed in the section through the ramparts to the immediate rear of the wall. The shocking result was that wherever we excavated, this wall deposit contained the articulated skeletons of people who, on account of their position, appeared to have been thrown in amongst the wall tumble, as the wall was being pushed in over them. In total, 11m width of ditch was excavated in two separate trenches, producing the remains of nine individuals. With around 400m of ditch circuit in total, it is likely that many dozens, and perhaps even a few hundred, individuals still remain buried in the ditch fill. Skeletal analysis of the nine individuals has revealed a curious story: all those able to be identified are women and children. There are two adult women, an indeterminate adult, four babies, a toddler, and a teenager. None of them show fatal trauma on their bones, and it therefore seems most likely that they died from soft-tissue wounds, perhaps by having their throats cut or similar. The adults and teenager showed evidence for interrupted growth, resulting from dietary stress — possibly from a period of famine. The teenager also showed signs of anaemia, which may have resulted from a lack of red meat in their diet. Seven of the skeletons have been radiocarbon dated to between 410-40 BC; unfortunately, because these dates fall on a radiocarbon calibration plateau, it means that even with the aid of Bayesian modeling we can only say that the their deposition in the destruction layer may have taken place from shortly after the accumulation of the primary ditch silt up to a couple of centuries later. The lack of ditch silting, and the fact that the rock-cut ditch seems never to have been finished, implies that the length of time between the construction of the wall and its destruction was short. In this case, the archaeological stratigraphy seems a more certain indication of the timing involved than the spread of the radiocarbon dates. The infill of wall destruction material provides a stronger case for the infilling of the ditch as a single event, than the possibility suggested by the radiocarbon dates that the people buried throughout the deposit died at different times. This is an extract. The full article can be found in Issue 255 of Current Archaeology, on sale now.